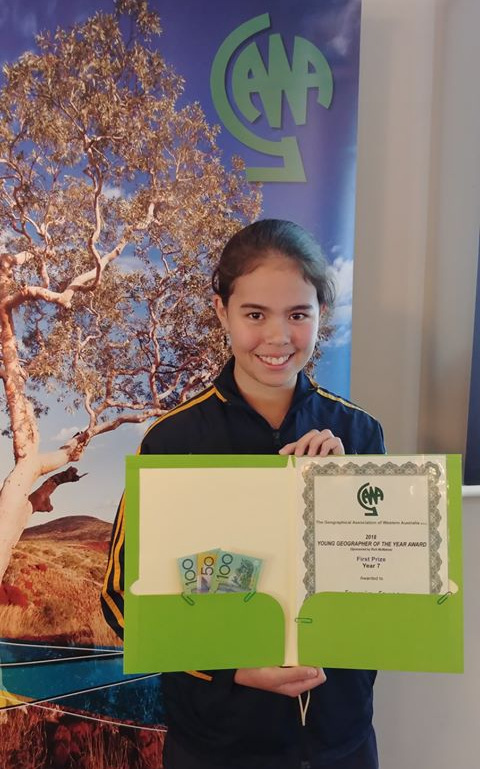 Enquiry into a beloved holiday destination has won John Willcock College year seven student Jasmin Joyner the Geographical Association of Western Australia’s Young Geographer of the Year Competition for her age group. For the competition, Jasmin researched her favourite Western Australian location, Augusta. She then turned her findings into an A3 poster that covered all of the competition criteria including information on livability, sustainability, space and the connection between people and place. Posters were judged not only on content, but also referencing and presentation. Jasmin spent six weeks working on her entry, which was also a school assignment. She said getting all the elements covered in a poster was tricky. “I had to do a lot of research and since Augusta is such a small place, I had to include information from Margaret River because they are in the same shire,” she said. Recently Jasmin and her family traveled to Perth to accept the award and $250 prize money. The Geographical Association of Western Australia has re-launched the competition this year, which is open to every school and year group in Western Australia. John Willcock College Humanities and Social Science Teacher Timothy Collier said that winning the prize was a fitting reward for Jasmin’s commitment to the project. “Jasmin put so much work into the project, a poster sounds simple enough but all of the different elements that needed to be covered made it really challenging,” he said.